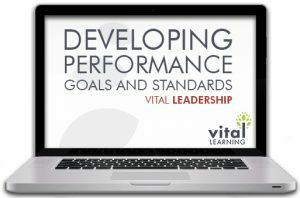 Developing Performance Goals and Standards is one of the courses included in Vital Learning Corporation’s Supervision Series. It focuses on interpersonal skills, emphasizing communication and improvement of management skills by using behavior modeling. 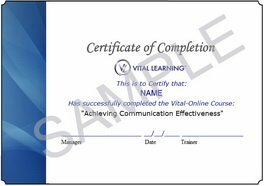 For maximum benefit, it is recommended that learners first experience the two foundation modules,Essential Skills of Leadership and Essential Skills of Communicating prior to taking this course. The audiences for this course are team leaders, supervisors, and first-line managers. Defining goals, objectives and performance standards. Identifying and set performance standards that are specific, measurable, attainable, results-oriented, and time-framed, using concrete active language. Establishing time limits for all performance standards. Involving team members in creating their own individual performance standards. Negotiating with team members to develop effective S.M.A.R.T.-based performance standards. Monitoring team members’ progress toward their goals by holding individual review meetings. Exercises, forms, skill practice aids, and a video synopsis. Job Aids section with tools and resources for applying the skills learned. Memory Jogger Card providing a handy reminder of the workshop’s skill points.